I wanted to do some editing of an svg file of a floorplan. However, when I import the svg file into my Affinity Designer on my Ipad the file is all messed up - with elements moved around. I've uploaded a screenshot of how the svg file looks in Affinity and how the file should look (I had it also as a png file). 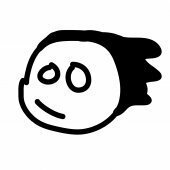 I've double checked my source file and it's fine and it opens fine in Adobe Illustrator. I don't have Affinity Designer for my mac so I couldn't test that. I tried it with a couple of different floorplans and the same thing happens. Is there something I can do to easily fix this type of file? Do you have the same font used in the original illustrator s go file installed on the iPad? When text is mucked up it is quite often because of font substitution. Thank you for the response. When I opened the file in Illustrator it said the font was Verdana and when I open it in Designer on the ipad it says the same and that font is installed. It isn’t only the text, anyway. The bathroom fittings have all floated out of the bathroom. Yes exactly. When I look into the layers I can select all the individual pieces and move them back into their rightful places - but that would be tedious and shouldn’t be necessary. I just can’t figure out why a bunch of pieces shifted on import. I’ve gone through the layers hoping it was just a group or two and I could shift the whole group back - but it’s not. And it seem to be really random where stuff got placed. Any chance you can attach the SVG in question? Thank you. I have logged it with our developers for further investigations. I was trying to see if it was the file - I had imported it into icloud to use on the ipad - and I opened it and another similar file and the original file in Affinity Photo on my mac and I'm having the same issue. Have both files been created by the same software? Yes. We use a 3D matterport camera to do scans of a house. 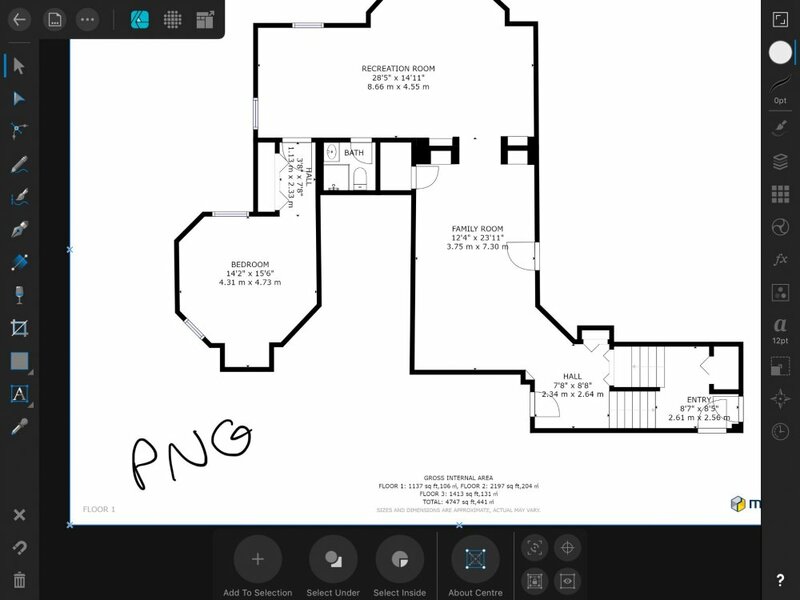 Then the scans are uploaded to matterport and they process them as a virtual walk through and we can get the floor plans. 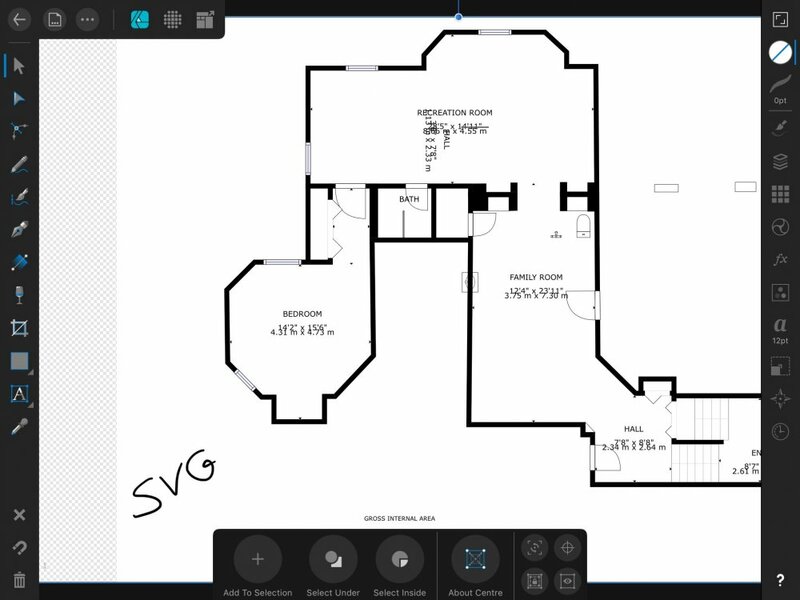 We download the floor plans as SVG and pdf files. The problem is that we can’t label the rooms before we get the floor plans and on larger houses they often resort to calling many rooms the ‘family’ room when our clients would like them differentiated by calling one a sitting room, one a recreation room, etc. I can make those changes to the SVG files in Adobe Illustrator - but it takes so long to open and is so resource intensive I thought I could save time by using my Affinity Designer. Hmm.. Have you tried saving them as PDF? Do you have the same issues? I receive the file as a svg, pdf and jpeg. I can open the svg in Adobe Illustrator and it's fine and I can save it as a pdf and that is fine. I can open the svg in chrome and it's fine. The only other program that I can open an svg file in that I have is Affinity Photo and Affinity Designer and it won't open properly in either of those. For the meantime, you can try to work as PDF. Should not be any difference in the workflow.